The British Boy band sensation, One Direction, visits the studios of 103.5 KISS FM Radio Chicago at the Coco-Cola Lounge on Friday, February 24, 2012. 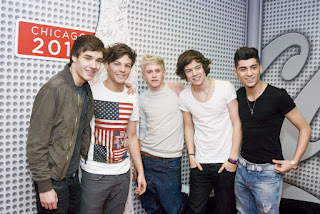 The Coke Lounge had hundreds of fans at the station to meet and greet One Direction. One Direction consists of Zayn Malik, Liam Payne, Harry Styles, Niall Horan and Louis Tomlinsons. One Direction became teen idols on The X Factor and quickly signed to a subsidary of Sony Music through Syco Records.